Home beautiful face beautiful skin clean skin dark skin dark spot eyes face mask health news healthy skin skin useful How to Tighten Loose Skin on Eyelids Naturally, Fast with Home Remedies! The Results Are Amazing! 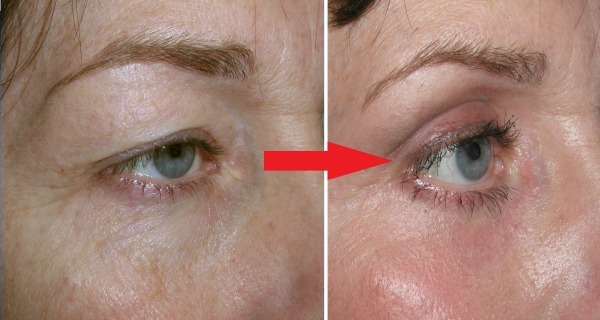 How to Tighten Loose Skin on Eyelids Naturally, Fast with Home Remedies! The Results Are Amazing! If you have a problem with lowered eyelids, you can try some natural cures for lowered eyelids, along with exercises for muscle toning of your eyelids. To get rid of lowered lids with natural remedies is simpler and cheaper solution than spending fortunes on creams, Botox injections or surgery. Learn how to deal with this problem in a natural way, with simple treatments and exercises for the muscles in your eyelids. The lowered eyelids begin as a cosmetic problem or simply with aging, but it can often lead to visual impairment if left untreated. Choose a natural remedy that is best for you before attempting with some drastic measures. Natural solutions for drooping eyelids! Traditional remedies for drooping eyelids include using cold slices of cucumber or raw potatoes and chamomile tea bags on your eyelids. Applying cold spoon on them can also have a relaxing effect on the muscles of the eyelids. To reduce puffiness use face cream with aloe vera, witch hazel, ivy or a distaff, or ginseng and caffeine. These ingredients stimulate circulation and cause drainage. Looking for the ideal cream, remember to search by the alphabet as the cream should contain the vitamins A, C and E because they stimulate the synthesis of collagen and blocks enzymes that break it down. Hydration is the best natural remedy for drooping eyelids. Most of the time, lowered eyelids are caused by lack of fluid intake, fatigue and stress. Improving your healthy lifestyle is the best way to treat the problem immediately after the notice. Drink plenty of fluids, especially water, herbal teas and fresh juices. Make sure you do not go to bed thirsty and drink a glass of water in the morning. Reducing the intake of salty foods, coffee and alcohol is also an important part of the best natural remedy for drooping eyelids. Exercising the muscles in the eyelids can sometimes be a perfect natural cure but works best in combination with proper hydration. Place your finger under the eyebrow, lift it slowly and gently, then hold for 10 seconds before you relax your skin. This exercise works best if you repeat it three times a day. Another great exercise for strengthening and toning your eyelids, is to put your finger on the temples, and gently pull the skin up toward your ears. When tightening the skin, eyes open and close in a series of quick movements, 10 times in a row. Use medications and exercises for toning muscles before you are thinking about drastic measures, give them time to start to work and fix your lowered eyelids without spending a lot of money. Here is a video on how to do it right, and few more exercises that really help!